This essay was written before Sid Coleman’s untimely death in 2007. In January 2007 Sid Coleman’s wife, Diana, sent a letter to their friends about his decline. It was troubling; Sid was one of those I most admired in fandom—indeed, in life. But now his particular sort of Parkinson’s had advanced until he could not live at home any more. Diana had placed him in a living facility, where she visited him daily. He went long times now without speaking, she said, but at times a glint of the old Sydney would flicker. His roommate, a cook, remarked that Sid seemed to be a nice man. “Appearances are deceiving,” Sid said, with a sly smile. Her letter set me to remembering. Sid was so much—physicist, raconteur, world traveler—and he gave much to science fiction. His teenage toils for Advent Publishers supported a scrupulous, ambitious role for fans in holding the field to its standards. Earl Kemp, Ed Wood, Sid and some others created a fannish publishing house, Advent Publishers, in 1956. He was a teenager when he helped publish Advent’s first book, Damon Knight’s In Search of Wonder. Week after week the fans gathered at Earl Kemp’s apartment in Chicago, catching typos in the photo offset text. Ed Wood, a very large fan with a very large voice, and Sid, maintained an unrelenting dialog about the purpose of science fiction fandom—Ed loudly proclaiming that fandom should “spread the science fiction faith,” while Sid insisted on a smaller purpose, like fun. Earl Kemp recalled that Sid was at his very best when criticizing someone for what he thought was a shortcoming. Sid’s inimitable trick was to do it with charm and wit that left the target injured but somehow happy about the whole thing and anxious to tell others about it. After all, Sid attended high school and university simultaneously, getting his bachelor’s degree when he graduated from high school, a feat I’ve never known to be equaled. Sid went to Caltech for his doctorate with Murray Gell-Mann in 1962, age 25. He attended LASFS meetings and swiftly became a major theoretical physicist. Many fans never quite knew his prominence. “I’m at the top of the second rank,” Carol Carr remembers him saying. I first met him in the 1960s, introduced by Terry Carr, who explained with a wry smile, “You’re both in physics and write for Innuendo [Terry’s fanzine], so you should probably know each other.” Sid was already both a better physicist and wit, of course. He was far more subtle and powerful in his mathematics than I. He showed how the cosmological constant could be forced to be zero in the early universe. This fit the prevailing prejudice among theorists that the constant, first introduced by Einstein to make the universe static, neither expanding nor contracting. When Hubble found in the late 1920s that the universe is expanding, Einstein said imposing the constant was a blunder, not because it was a bad idea, but because Einstein didn’t see that the resulting equilibrium was unstable. Any minor jiggle would destroy the static state, starting motion. Even with the constant, he should have foreseen that Hubble would either see a universe growing or shrinking. Sidney had no prejudice either way on the value of the constant, but he did see a pretty way to use quantum mechanical ideas to propose a sweet model—the sort of confection theorists hold dear. I was startled by the intricate audacity of his calculation, as were many others. At the time I had been working on some wormhole calculations myself, much more prosaically trying to find a way to see if we had any wormholes nearby and if they could be found out through their refracting ability. Some wormholes might develop one end that looked as though it had negative mass, since its other end had funneled a lot of mass out through its mouth. These would yield a unique refracting signature, two peaks, if a star passed behind it, along our line of sight. Find the two peaks (rather than one for ordinary wormhole mouths, or any ordinary mass) and—presto, a gateway to the stars, maybe. It was a clear longshot. Sid had no illusions about his model—it was a longshot, too, that just might be right. Worth a chance. I felt the same. We haven’t found any refracting wormholes, either. That’s just how science goes. When Sid’s decline became evident, the Harvard physics department put on a Sidneyfest that ran over a weekend. Some reports on this event, with pictures, are at HYPERLINK http://www.physics.harvard.edu/QFT/sidneyfest.htmhttp://www.physics.harvard.edu/QFT/sidneyfest.htm. 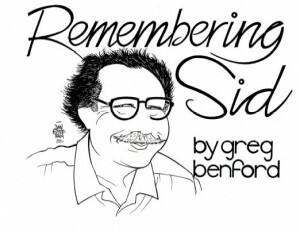 Sidney was a beloved teacher of graduate students, and many of them attended the Sidneyfest. Sid referred to the community as i fratelli fisici, by which he meant the brotherhood of physicists. (Most physicists speak at least a bit of broken Italian, a legacy of the grand and highly influential summer schools organized by Nino Zichichi in Erice, Sicily.) In a physics career one often arrives by train or plane, anywhere in the world, on the way to a conference or academic visit. One of the fondest reflections of being a scientist is to then be greeted by a total stranger, who immediately treated one like an old friend. Erice was like that; the brotherhood of science. With good food. The town likes the NATO-backed workshops because they bring an elevated form of tourism to the ancient town on a granite spire, perched a kilometer above a beautiful beach. One year a noted German physicist drove down in his brand new Mercedes and parked it outside the workshop buildings, which were once a convent. He emerged an hour later to find the Mercedes stolen along with his luggage and all his lecture notes. The German panicked, and Director Zichichi led him back inside to give him a glass or two of good Sicilian wine. Emerging an hour later, there sat the Mercedes. Zichichi had ties everywhere. The local Mafia had found the thieves. Then they kindly returned the car, washed, waxed and fully fueled—an impressively offhand way to show real power. Sid always loved telling this tale. I had given a lecture series there in astrophysics, suspecting that the true appeal of Erice was the meal chits they gave out for attendees. Good in many of the best restaurants, these allowed for wine with the meal, no questions asked. This single gesture made the afternoon sessions either lively or dead, depending on the quality and quantity of the wine. But Sidney avoided the wine, focusing on clarifying his own lectures right up to the last minute. His careful, insightful summaries of the state of knowledge in field theory became famous and appeared as a book devoted solely to them. One of the Sidneyfest attendees who got his doctorate at Harvard remarked, “How do you do physics at Harvard? You go to Witten to give you a problem to work on. You go to Coleman to tell you how to solve it. Then you go to Weinberg to write you a reference letter.” Ed Witten is the Einstein figure of string theory and much else. Weinberg won the Nobel for what we now call the Standard Model. Though I’ve never met Weinberg, I learned a lot of physics just working through a Weinberg calculation he did as a toss-off for a classified project I worked on in the late 1960s, given the problem by Edward Teller, who had hired me in 1967. Weinberg’s footprint in the calculations was impressive. He came a decade ahead of me in the profession and I rather regretted showing that the method he studied would not work in reality. But physics isn’t just about getting everything to work; it’s about the truth. Weinberg was no sharper than Sid, but he happened upon an insight that proved out true quite swiftly. There is a lot of luck in science; many of the brilliant just don’t hit quite the right problem. Sid won prizes, several Sidneyfest attendees remarked, but not the big ones. There were many Sid stories. One was about being at a physics meeting where Stephen Hawking spoke up from his wheelchair. This was around 1976, when Stephen could barely control his throat, and struggled to make his points in his semi-unintelligible way. His comment contained a detailed, abstruse mathematical argument and went on for minutes. Sid said that he was tempted to reply, “That’s easy for you to say,” but held his tongue. Rather than his physics, I remember best Sid’s brilliant wit. He once remarked about dopey plot twists, “The one good thing about stupidity is that it leads to adventure.” I’ve often thought that applies to life as a whole, too. If only A. E. van Vogt had thought of this economical idea! Of course, Sid had his oddities. He was the worst driver I ever knew, distracted by conversation with his passengers, oblivious to the screech and shouts of near-accidents. Marta Randall remarked on how when she was the lead car on the several-car trip to a restaurant, she always saw Sid in her rear view mirror in profile, attentive to his passengers. But then, Feynman considered dental hygiene to be a superstition, despite his rotten teeth. Einstein hated socks. We have our foibles. Sid did indeed look a lot like Einstein, but he loved SF whereas Einstein deplored it. Lest SF distort pure science and give people the false illusion of scientific understanding, Einstein recommended complete abstinence from any type of science fiction. “I never think of the future. It comes soon enough,” he said. Sid is just the opposite. As he fades from us, his departure from our midst leaves a vacancy that echoes, unfillable. I only met him once and wish I’d had the chance to know him better.